So, way back last August or so, we decided to handle the US/Canada portion of our trip by RV (recreational vehicle). Our thinking was that we could buy a moderately priced used RV, use it for the five months or so, and then sell it (via consignment). This wasn’t — and isn’t — a terrible plan, except for one small detail: neither of us had ever stepped foot inside an RV. We looked into renting an RV, but it was price-prohibitive for a five month period, plus most of the RVs we could find for rent were set up such that at least one of the kids would need to take their beds up/down each day for family use (i.e., they’d be sleeping on the dinette/pull-out couch). I’m sure that’s fine and a novelty for a week or ten days, but we decided early on that five months of that would get old for everyone. I poked around further, and we found “bunkhouse” Class C RVs, but they were very few and far between, and the prices for bunkhouse RVs, even used, appeared to be at least a good $15,000 more than for comparable non-bunkhouse RVs. We also investigated pulling a tow vehicle (one doesn’t want to constantly break camp to go to each tourist attraction or even the grocery store), and that seemed expensive and problematic as well, especially given that the car we intended to pull was Mike’s Honda Prius. 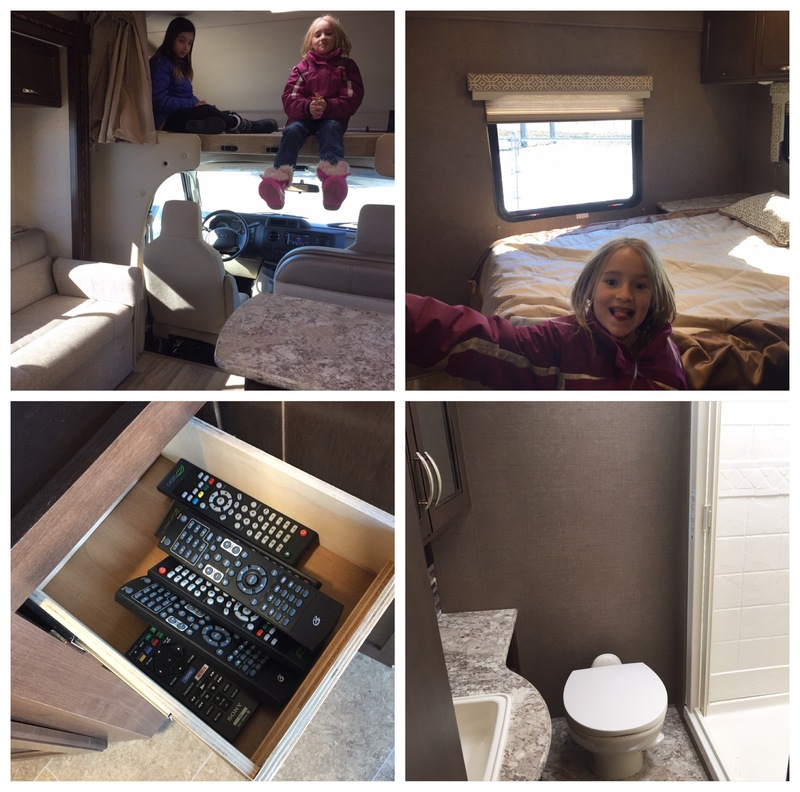 RV Shopping — That RV had more remote controls (and more televisions) than we have in our house. Over time, we came to the conclusion that a Class C RV didn’t make as much sense for us as we’d first thought. We then started considering travel trailers and/or fifth wheel trailers. From the time I spent up in Maine, where I’d learned about the “fun” of fish-tailing trailers with my then-boyfriend’s boat, I wasn’t particularly excited by the idea of a tow-behind travel trailer. Apparently stabilizers and weight-distributing hitches can help, but I still wasn’t sold. Fifth-wheel trailers, however, sounded interesting: they’re spacious, many more come in a “bunk-house” floorplan, and they’re much less prone to problems with trailering due to the stability of the hitch sitting in the bed of the pickup truck. I spent a lot of time doing research on all of these options, and the more I researched, the more concerned I became. It seemed — from reading through various RV websites and Facebook groups, that many things could — and often did — go wrong. 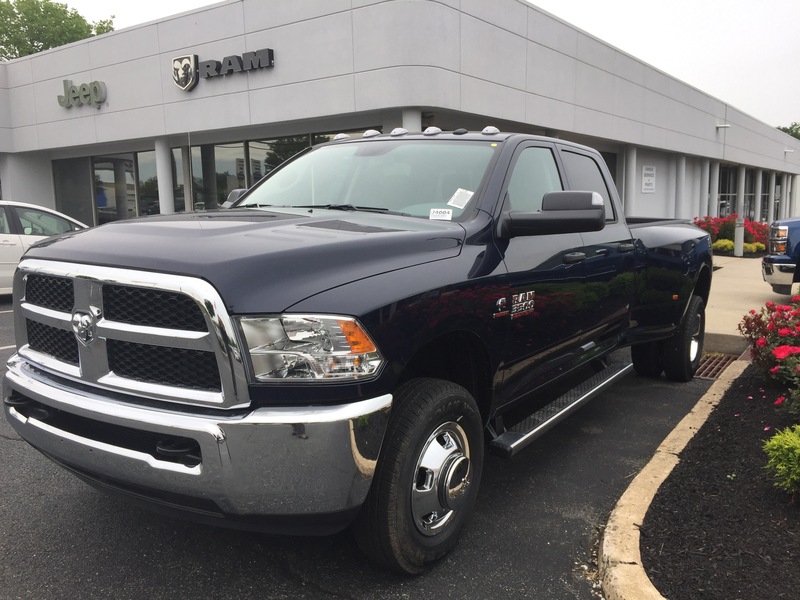 So here we were looking at a hefty investment into a large pickup truck (I like pickups, but the size pickup I was looking at isn’t particularly practical to be a “mom-car” after the trip in our inner-ring New York City suburb with its tight parking, narrow driveways, and small detached garages. Nevertheless we persisted, going as far as to make a deal (I thought), which included laying out a down payment on leasing a massive pickup truck. The day after I put down the down payment, the shady car dealer from which I’d planned to lease the truck called to say that the lease company they’d quoted me with simply didn’t write leases for the type of truck I was planning to buy and that some other lease company would do it, but for $50 more per monthly payment. I politely told them to go take a long walk off a short pier, and demanded return of my deposit. The truck I thought I’d leased (but thankfully did not) from the shady car dealership. In retrospect, I think this was the best thing that could have happened to us. I was getting more and more nervous about the whole RV endeavor, I was seeing that new (and some not-so-new) RV owners regularly were making mistakes that were causing serious damage (and serious repair bills) as well as time lost on the road, and I was freaking out more and more. I spent an evening and a day re-thinking our plan, including pricing out the first few weeks of the trip via AirBnB. Then I sat down with Mike last Saturday morning and had a long discussion. Unlike me, he had not been doing a lot of nitty-gritty research about the realities of owning, maintaining, and traveling in an RV (he had just finished his last day of full-time work on Friday, and since he’s continuing to work part-time, he was still more focused on the earning money portion of our plans). I talked to him a lot about my concerns, and we ran a bunch of numbers comparing costs and had a lot of discussion about relative risk (both financial risk and risk related to derailing our plans for this trip, such as two weeks stuck in Indiana or something like that — no offense to Indiana, but you get what I mean). And so, tempting as it initially sounded, we decided to bag the idea of the RV. Then we went to speak to the kids about it. Surprisingly, Julianna, who tends to be our more-in-need-of-a-space-to-call-her-own kid took it really well. Elizabeth, who is much less that way, reacted negatively. On the other hand, I realized in retrospect that Julianna is also much more of our go-with-the-flow kid, and Elizabeth is much more of our we-had-a-plan-why-didn’t-we-stick-to-it-even-if-the-new-plan-is-better kid. In other words, Julianna is much more like me, and Elizabeth is much more like Mike. But in the end, after a bunch of discussion, both kids were on board with the change of plans (which is good, as they didn’t really have a choice once Mike and I were united on the subject). We still, of course, needed a vehicle for our cross-country trip. Fuel efficient as Mike’s Prius is, our kids fight like cats and dogs sitting in its rear seat on even relatively short trips, and in terms of luggage capacity, it was not what we wanted for this portion of the trip (obviously once we’re traveling by air luggage will be a whole new world, but I think that learning to reduce in stages makes more sense). My 2009 Mazda5 (we call it the mini minivan) is not in good shape and also is a little too mini for our purposes. Plus, I’d already promised it to my cousin Brian, who is moving home from Thailand next week to finish his last two years of college back in the USA. So the new car shopping wasn’t finished. 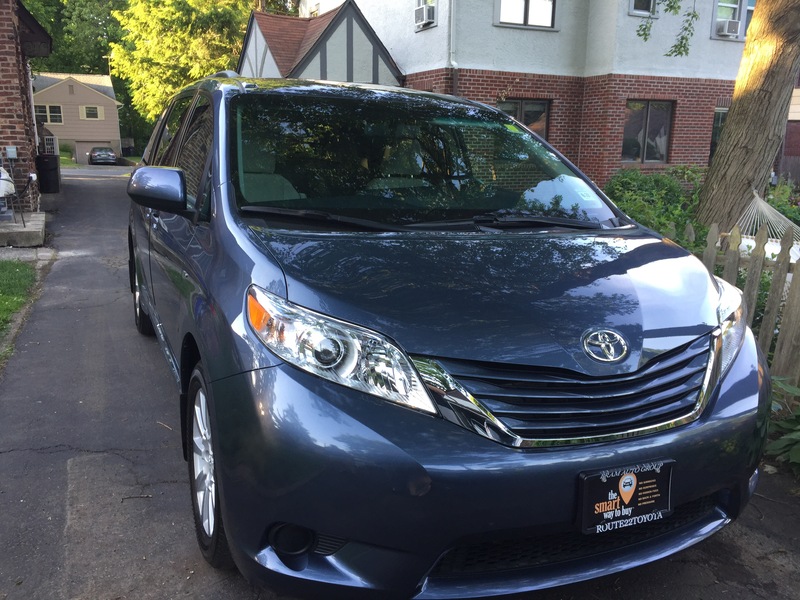 After a bunch of poking around, I settled on a Toyota Sienna, as it is currently (as far as I can tell) the only full-sized minivan on the US market that offers all-wheel drive. One thing that has really bugged me about the cars we’ve had is that we had no car with all-wheel or four wheel drive, and my brother lives in northern Vermont, where he spends all of his winter weekends as a ski patroller. One reason I don’t get up there much in the winter is because I hate driving up and down that mountain in my Mazda5 in the snow. Snow tires help, but going up there in winter has still felt like a sketchy proposition. So the AWD Sienna plus snow tires seems far more versatile, especially if we stick a roof-box on top. Yesterday morning we went to test drive the Sienna. At the first dealership we went to (near our house), our salesman turned me off instantly by wanting to discuss numbers and buying options before taking a test drive (wtf?) and then, more egregiously, by saying “Thanks, babe” to one of his female coworkers who’d done him a favor. Gross! When I finally did get to test drive, he was really condescending to me (ironically, far more so than any of the salesmen when I was looking at giant pickup trucks). He also tried to claim that they didn’t have the fewer frills model of the Sienna on the lot (I’d already checked their inventory online) until I called him out, and then lied about what the dealer invoice price was (yes, I know that dealers get additional money off below invoice, but don’t lie to me about the invoice price). Mike was appalled too, so it wasn’t just me. So I looked at the sales guy, said I was really offended by his use of the word “babe” to his coworker in 2017 as well as the insult to our intelligence in the ridiculous price he suggested, and left the gross car dealer with the misogynistic salesman. I called around to other dealers, got them bidding against each other a bit, and then bought the car at even a little less than what my internet research had told me was the going price for the car in our area. I may not have gotten the best possible deal, but our new salesman was adorable, didn’t condescend to me, and showed me exactly what I wanted. Yay Bernard at Route 22 Toyota in Hillside, New Jersey (the dealer east of the Garden State Parkway, not Autoland Toyota, which is west of the Garden State Parkway in Springfield). The new, blue Blaine Mobile. We also think we will have enough cargo space to bring our tent-camping gear along with us (at least once we stick a roof-box on top). Now, I felt way over my head with the RVs, but I don’t even remember how many times I’ve gone tent camping in my life. I’m 100% comfortable camping in a tent, operating a Coleman stove, building a fire, and doing the rest of the chores involved in tent camping (especially when camping next to my car). 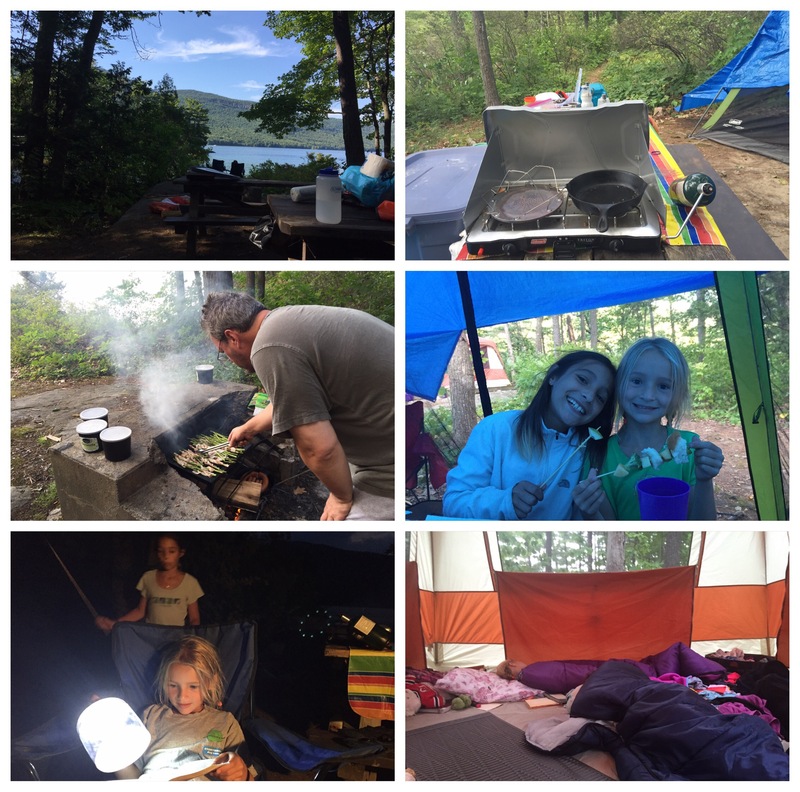 The last two summers, I spent a week island camping on Lake George up in New York State with the girls (boats also fall within my skill set). So not only can we cobble together a trip in motels and AirBnBs, we can also throw in a fair amount of tent camping, which should actually help to defray our lodging costs significantly (unlike RV sites, which tend to run much more expensive in the northeast where you need hookups and such). Last year on Lake George. And so, instead of setting off on a cross-country road trip RV adventure, we’re setting off on a cross-country road trip motel-AirBnB-tent camping adventure. 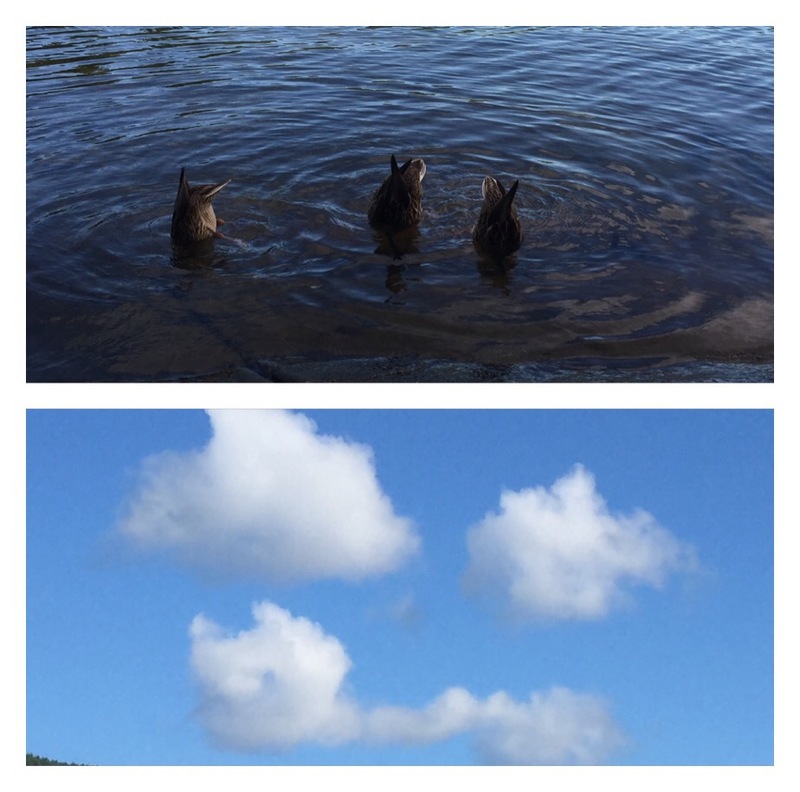 I’m really excited for our new plan, and so I leave you with two of my favorite photos from Lake George, duck butts and cloud smiles. And for those of our neighbors and friends who are a little confused about the new blue Blaine Mobile in our driveway, now you’ve got an explanation. Duck butts and cloud smiles.